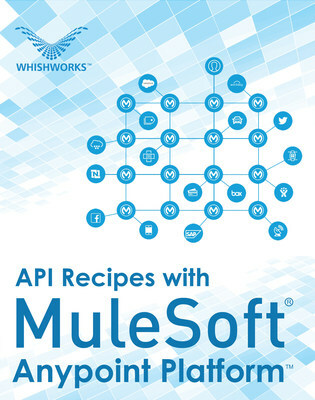 WHISHWORKS is pleased to announce the release of API recipes for MuleSoft's Anypoint Platform™, a new guide that helps developers and architects design, implement, and deploy feature-rich APIs with MuleSoft's Anypoint Platform. Written by WHISHWORKS' expert team of MuleSoft specialists, the guide includes 31 recipes for some of the most common requirements in systems integration, enabling organisations to further accelerate API-led connectivity and more quickly build out their application networks. Each recipe follows best practices and gives users a comprehensive step-by-step approach with easy-to-follow instructions, real-life examples and access to the recipe's code. The guides use RESTful API Modeling Language (RAML) for API specification, which enables rapid, concise, and iterative API design while promoting consistency and reuse. "WHISHWORKS has been a partner of ours for more than four years and we are continually impressed by the energy and resources WHISHWORKS dedicates to make sure their clients are able to further accelerate development on Anypoint Platform. The API guide created by WHISHWORKS is a valuable contribution to organisations looking to easily build and rapidly scale application networks," commented Brent Hayward, vice president of global partners and services, MuleSoft. "At WHISHWORKS we are dedicated in helping businesses realise the potential of their data and succeed in their digital transformation journeys. Since the beginning of our cooperation with MuleSoft in 2013, we have accumulated a pool of expert know-how and skills driven by our MuleSoft Centre for Enablement acquired a significant number of Anypoint Platform certifications, and been named a MuleSoft Partner of the Year for three consecutive years. This guide amalgamates everything we learned out of hundreds of implementations and we know it will help aspiring MuleSoft users become MuleSoft fans like us," commented Suman Konkumalla, Chief Strategy Officer at WHISHWORKS. WHISHWORKS is a global IT services and consulting company, specialising in systems integration and Big Data analytics since 2008. The company works with an ecosystem of systems integration and Big Data partners, including MuleSoft, Hortonworks, MapR and Cloudera, to develop leading solutions that enable digital transformation. Over the years WHISHWORKS has helped hundreds of businesses access, control and monetise their data becoming the partner of choice for data-driven organisations. MuleSoft's Anypoint Platform™ is a leading solution for API-led connectivity that creates an application network of apps, data, and devices, both on-premises and in the cloud. This hybrid integration platform includes iPaaS, ESB, and a unified solution for API management, design and publishing.